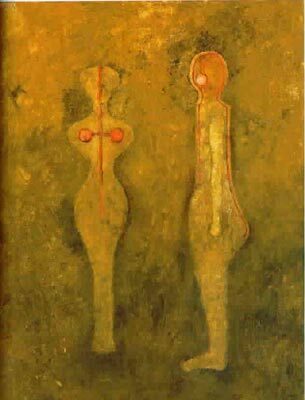 Rufino Tamayo (1899-1991) was a Mexican painter, a contemporary of Diego Rivera, Jose Clemente Orozco and David Alfaro Siqueiros. Unlike the political/socialist muralists, Tamayo’s work was determinedly apolitical and was influenced by his independent studies of the modern artists of the day, his subsequent trips to New York and Paris, and his exposure to the art of the Impressionists, the Fauvists, the Cubists, the Surrealists and the Abstract Expressionists. In each case, the influence of these movements informed his art, but did not overtake or subvert it. His Mexican heritage and his lifelong, avid fascination with pre-Colombian art shows in his use of color, his subjects and the texture and the plasticity of his use of paint. He combined modern European painting styles with Mexican folk themes. By a continuous process of assimiliation and change, Tamayo turned his painting into his own visual, metaphorical language. By going a little further along this road he was to come to Braque. My palette is limited, as limited as possible, for I think that the secret of color consists not in the use of all the colors in existence but, on the contrary, in the proper handling of just a few, from which one may extract all the possibilities of tone. I do not believe in either Mexican or Latin American painting. I can only conceive of painting in its most universal sense. The increasing importance of the mass media has done away with everything that could be localistic… I have always been opposed to pseudo-Mexican art. The most one can say is that there is a kind of common stamp, since all of us do belong to a certain place and to a certain moment in time. But art is universal. If one has authentic roots, there is no need to look for anything: that stamp that identifies us will appear of its own accord. My main concern, really, is to resolve the picture with its own elements: to define its balance, with that mysterious sort of mathematics which, even when it is applied intuitively, makes it possible to turn a picture upside down without any loss of significance, quite independently of the subject — for the subject doesn’t really matter. But what interests me most of all is man and the way he faces the problems that surround him. Art must belong to its time: it should not be concerned with memories but with what is happening now. And the artist is the antenna. He cannot be passive or content merely to dream. Art is fundamentally a message, a means of communication. 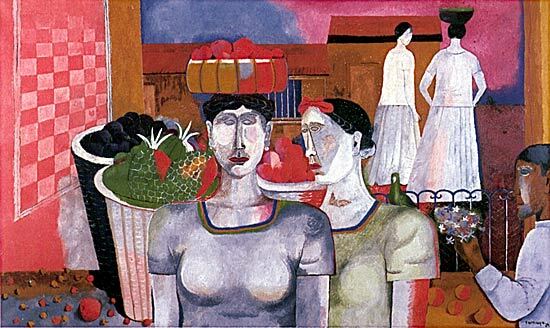 I think Rufino Tamayo is an excellent example of both how to absorb and digest artistic influences and not lose yourself to them, as well as how to comfortably inhabit your heritage, recognizing that it inexorably appears in your mode of expression but that it needn’t be its only defining characteristic. And a further thought for Contributors and contributor-would-be’s: I love the notion of a “Close Reading,” focusing on just one painting and talking about it. We could do that same kind of thing on Ragged Cloth, examining one of our favorite works of art up close. Think about it. I don’t think we should use the Times title, but as a way to feature a particular kind of thinking, it seems to me it would work. If someone has a suggestion for a title for the feature as an on-going entity, let’s hear it. The New York Times today (Sunday March 25) has a “Close Reading” feature on one of Tamayo’s paintings. A large number of his works (around 100) are on exhibit at the Santa Barbara Museum of Art. The Close Reading feature examines “Los Astologos de la Vida” “The Astrologers of Life” — stargazers writ large. 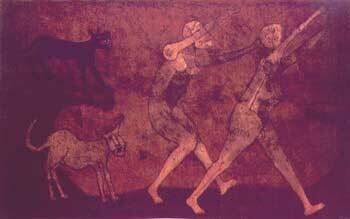 It also has further information on Tamayo, particularly his work in the 40’s and 50’s. And I learned what art which is sort of representational and also abstract is called “abstract figuration” (deKooning/Picasso) or “figurative abstraction” (Tamayo). And good morning to you all. I’m practising my html code below, but since I can’t check whether I’ve got it right before I post, I’ll give you both an elegant link and the clumsy http link. I first saw Tamayo’s work at a Manhattan museum many years ago – probably MOMA. It instantly drew my attention and he’s remained one of my favorite contemporary artists ever since. His use of color, tonal values and abstract form is masterful. The additional quotes are really helpful — and fascinating. I’m thinking that this time period — 1910 — 1960 or so — was full of painters who felt strongly that their art was getting at the heart of universals, although they all disagreed about what that universal was. He left for New York where he was exposed to more art (Matisse in particular at a show in Brooklyn) and artists. One of the pervading themes of his work (paintings, murals and mixographs) was the exaltation of universal myths, concepts which seemed to him to be essential for all mankind. 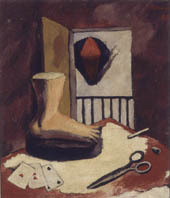 He was able to remain closely tied to his country, its colors, its ancient cultures because he was able to assimilate the influence of artists like Braque, Gauguin, Picasso, Matisse while experimenting with his own techniques, symbolism and expression. I’ve been trying to find a good definition for a term that shows up a lot in spanish when discussing visual art, “artes plasticas”. I think it’s a good description of textile art as well. The closest I can find is art in a tangible form, or art expressed in a subjective form. Thank you very much for the introduction to this artist. On googling him I particularly like his 1950 painting Dos Amantes contemplando la luna. It is interesting to see who can transcend influences of whatever kind, and I enjoy visiting retrospective exhibitions of great artists, such as Jackson Pollock for that reason. It is so much like learning a language: first we have to listen, to hear what and how others are speaking in order to try to speak for ourselves, choosing the what as well as the how. Doesn’t Tamayo contradict himself, as when he says “I do not believe in either Mexican or Latin American painting” and “Art must belong to its time: it should not be concerned with memories but with what is happening now.” Certainly in his earlier work, even when he is using modes popularized in Europe, he seems to me to come out of Latin America — it may be what I love about him. The last image isn’t so located, but seems to follow what went before. Your comment, that one’s heritage, “needn’t be its only defining characteristic” seems most apropos. I am a bit confused about Man and Woman — woman I recognize, but “man….” hmmmm.